Within the CRM you have a host of standard Reports to get you started when analysing & managing your CRM data. 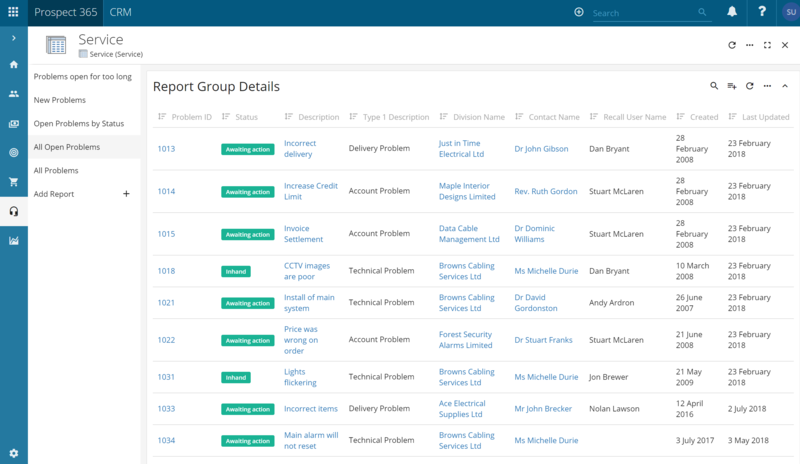 The Service Report Group includes all standard Reports relating to the Problem record within the CRM hierarchy. The 'Problems open for too long' Report by default lists all Problem records that have been created more than 7 days ago. The aim for this Report is to help identify bottlenecks & customers that may experience a delay with their customer service query or issue. If 7 days ago is too recent or too long for your business, then you can change this within the filters. At the top of the Report you have a summary displaying the total number of Problem records meeting this Report criteria. The 'New Problems' Report lists by default all Problem records created in the last 7 days. The purpose of this Report is to monitor how many new customer service queries or issues have been logged recently, helping to forecast your customer service resource. Again if the last 7 days is too long or too short for your business, then you can change this within the filters. The 'Open Problems by Status' Report lists all Problem records in an open status & groups them by these statuses. In the example provided there are 10 Problems in a status of Awaiting action & 5 Problems in a status of 'In Hand'. The 'All Open Problems' Report simply lists all Problems that are currently open within your system. There is only one filter on this Report which is only showing open Problem records & there are no grouping & summaries featured on this Report. Please note you can still add these in if you would prefer. 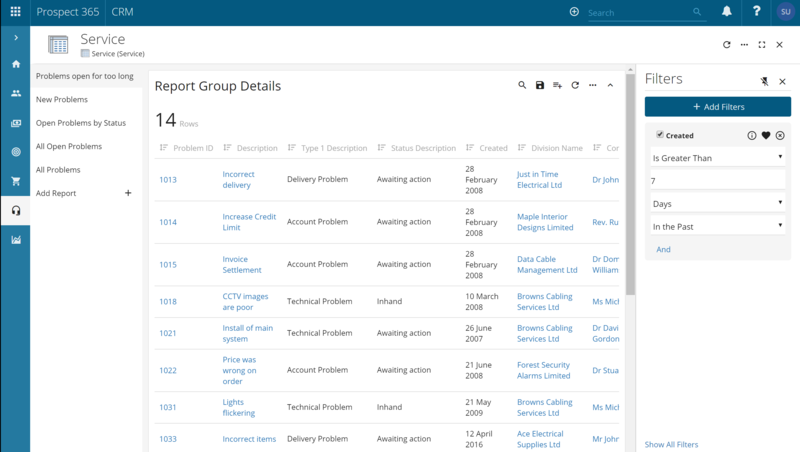 The 'All Problems' Report lists all Problem records within your CRM database. The Report does not have any filters, grouping & summaries, but again you can still add these in if you would prefer. 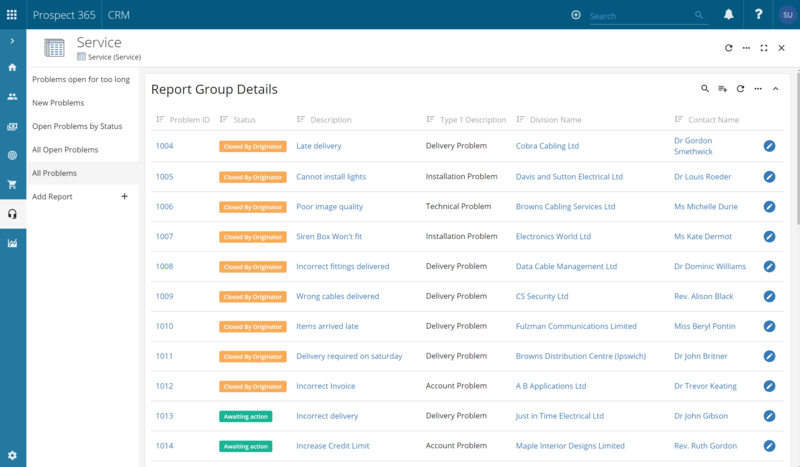 The purpose of this Report is to give you a comprehensive view of all Problem records that have been logged in your CRM. 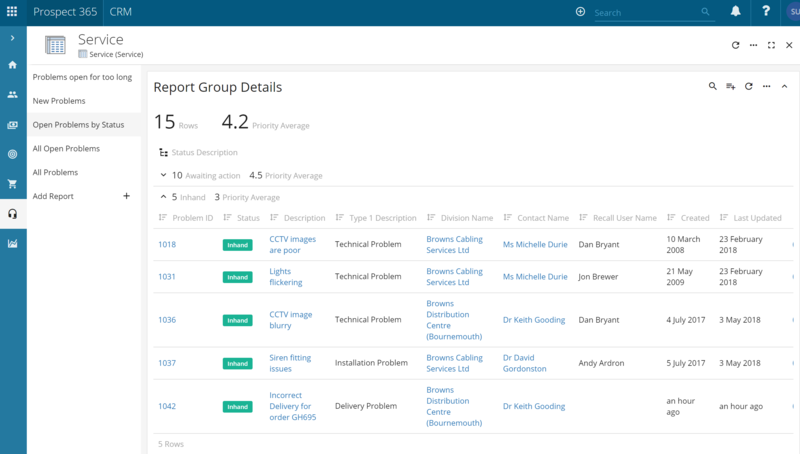 If you require a different Report & would like to create your own Service Report then please take a look at the Report Builder article.